I feel a certain guilt. This week I have been cooking like a maniac. As in M-A-N-I-A-C. I have been re-reading my cooking school binders, repeating recipes from brown stock to consumme, beurre blancs and hollandaise. I made a MEAN pear champagne vinaigrette and pasta from scratch (ravioli AND linguine... actually carbonara by the time I was done with it...). Then there was the mahi-mahi both seared and baked off, then on skewers with bacon. And the New York steak with blue cheese compound butter (all in the name of 'practicing' my cooking techniques and credentials). And the scallop---LOL---I bought just ONE large [fresh, dry-packed] scallop for a whopping $5---just to see if I could perfect the sear we are ALL looking for. I made my family enchiladas from scratch, fresh salsa (pico de gallo, actually) and roasted pork with a quick rub and most amazing reduction sauce... ahem. And those sugared walnuts were perfect in that arugula salad with blue cheese... did I mention the brown sugar rosemary cayenne compound butter? It is now sitting in a log in my freezer, waiting for the next batch of sweet potatoes. I recommend: serving them roasted with a toss of blue cheese crumbles. OMG. good. Why feel guilty? Because I took no photos, wrote zero lines and have very little to show for it all (except maybe an extra pound or two?). So YOU don't benefit. And what kind of blogger am I if I don't gloat, share, show-case and show-in-tell, like when I was in elementary school?!!! Look. See? I MADE this! How cool is that?! You should not forgive me. How can I make it up to you? Maybe some caramel sauce? A quick synopsis on my last cooking class? Kisses? How about a fantastic trick? 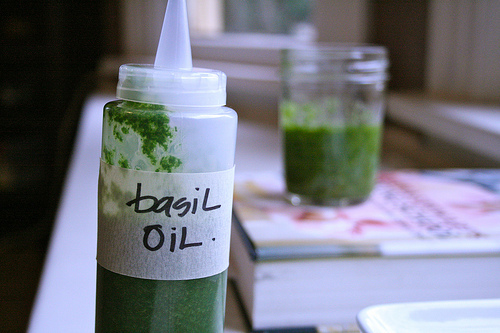 Oooohhhh I have an idea, two words: Basil Oil. My new favorite kitchen trick. This is brilliant, folks. It is all about the food, the methodology, the flavor profiles and don't knock it: the presentation. Some lively green basil-oil dotting the plate, drizzled over pasta, drawing a flower under your humble vegetable stack: makes all the difference. Here is how you make it: boil water, and set up an ice bath (bowl with ice cold water). Get out your little food processor and a pair of tongs, plus a large bunch of basil (about 1 1/2 cups). Once your water is boiling: snag basil stems with your tongs and give your basil a leaves-first dunk for 10 seconds. Remove basil and give it the same dunk in the ice water (I wouldn't wish that experience on anyone: boiling then ice? But in this case it locks in the color and nutrients), for another 10 seconds. Dry and puree with enough olive oil (up to 3/4 cup) to make it squirt-able. Funnel into squirt bottle and drizzle to your heart's content. Keeps well in fridge.